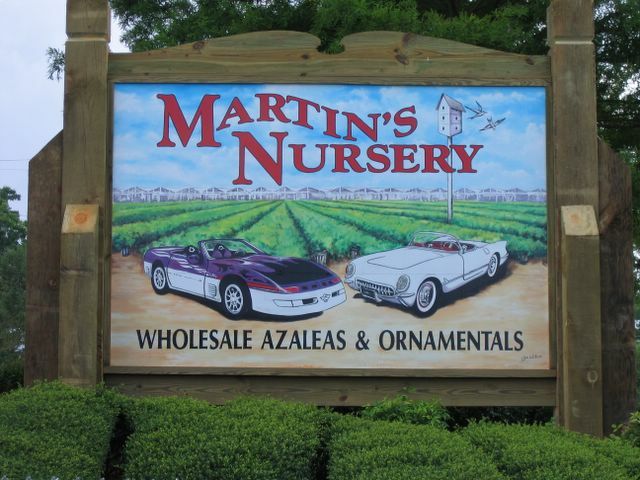 Martin's Nursery was founded in 1973 and has grown from a "hobby" house to over 110 irrigated acres of bed space. Growth has been steady for the nearly half a century we have been in business. Early expansion was limited to small parcels of land, purchased from other Martin family members, by our founders Buddy & Melba Martin. The next phase of growth was fueled not only by the full time commitment by Buddy in 1980 but also by acquisition of land off site. At one point, four locations were being operated on Snow Road. 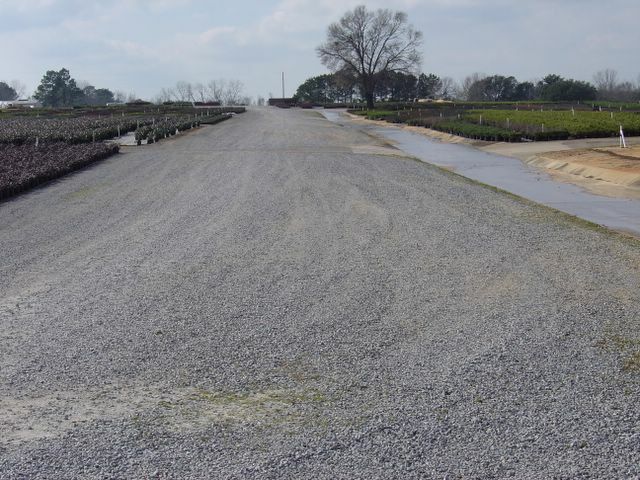 Ultimately, the balance of the Martin family land, formerly Martin's Dairy, became available for sale and is now a part of Martin�s Nursery. All of our current operation is now in one location. Until recently this location was comprised of 200 continuous acres, including our Watkins Division. This was completed in 1998 and consists of five acres of gutter-connected greenhouses. These were erected in two separate ranges mostly for the purpose of winter protection. On cold winter nights, it's comforting to know that a portion of our investment is wrapped up snuggly in the far reaches of our 'backyard'. In June 2003, our 'backyard' expanded with the purchase of our neighbor of many years, Paul Dodd Nursery, bringing our total acreage to 280. A product line of quality container grown woody ornamentals, flowering shrubs, small fruit and trees comprises our mix. Pot sizes include 7's, 3's, trade 3's, full gallons, and trade gallons. 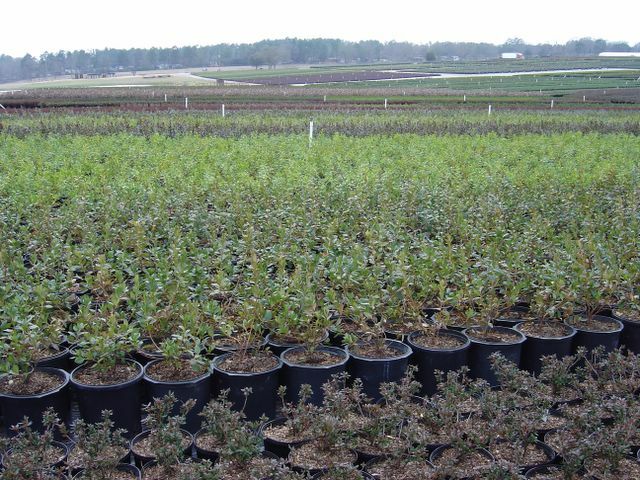 Over 50 varieties of traditional azaleas account for 60% of our plants, while the remaining 40% is made up of hollies, boxwood, cleyera and an expanding line of general woody ornamentals, including a good selection of mast producing hardwood trees and small fruit. Cleyera Japonica is our strongest specialty and is one of the only two items propagated from seed (other one being trees) while everything else is started from cuttings. All of our propagation is done in a peat and perlite mix. 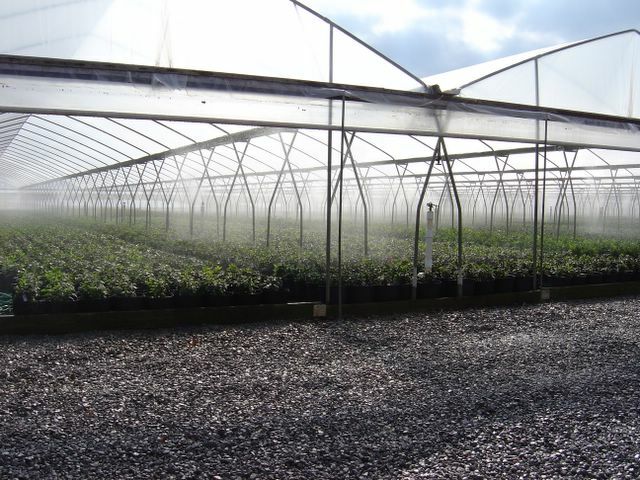 Propagation planning is geared towards our two marketing goals, a generous supply of promotional trade gallon azaleas as well a seamless inventory of finished landscape grade plants. 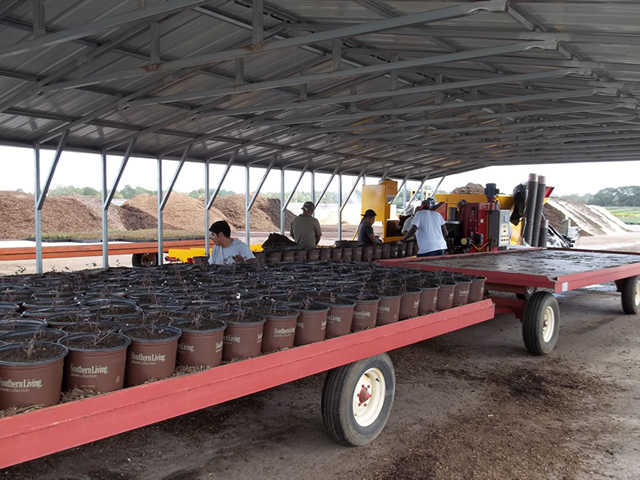 All potting is done by machine, either Javo or Ellis. The Javo is trailer mounted and used on location to fill beds of one or two gallon material with a seven man crew. Polyon fertilizer is dibbled and cell packs are stepped up at the machine, which is capable of over 25,000 gallons in a ten hour day. Larger material is potted on the stationary Ellis machine using liner material ranging from cell packs to full gallons. Varying the liner size helps us to stagger our crops in stages. This machine is capable of potting over 30 three gallons per minute and more than 20 seven gallons in a minute. All soil mixes are comprised of pine bark and are amended with lime, minor element package, and Talstar. Polyon remains our primary fertilizer for dibbling and for top dressing. Most irrigation water is pumped directly from wells through impact sprinklers. Runoff is collected in a series of retention basins through a system of concrete ditches. These ditches double as solid roads for pulling orders. Most spraying is done with shorter reentry interval products using a blower sprayer. Generous pruning is done using gas and manual sheers. 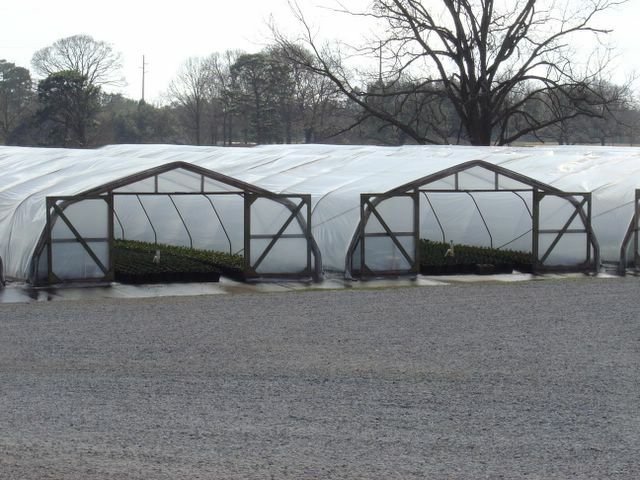 Winter protection is emphasized and our roughly ten acres of total greenhouse space plays an important role. Many cultural practices are geared toward cold weather survival such as hardening off with tapered pruning and fertilizing. 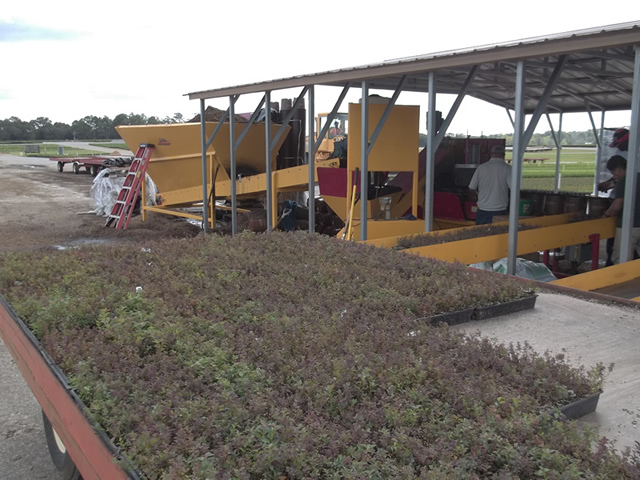 We continue to use spun bonded fabric for covering nursery stock in the field using rock bags and dirt buckets for anchoring. A lot has changed here over the past nearly half a century and things will continue to change. Martin's Nursery has come a long way from a small "hobby house" behind Buddy and Melba's house to the 280 acre nursery It is today. Without the tireless dedication of our owner Buddy Martin and our manager Bill Turk, along with the dedicated commitment of our incredible team, we would be nowhere near where we are today. We also would be remiss not to credit our customers for our success. We can grow all the plants we want but without our wonderful customer base, we would have no way of getting them out there and in the ground. To those of you that have never come by the nursery please feel free to drop by and see us, we would love to show you around. And for those of you that have been here before, come on by again and we can show you some new things we have going on. Either way, we are looking forward to seeing you! Feel free to go to our "Contact Us" page and shoot us and email or give us a call. We will be more than happy to help you find what you're looking for. Thanks for visiting our website and THANKS FOR YOUR BUSINESS!